Instead of having a runway fashion show –like the ones she only knew how to do it, Astrid Andersen is having a fashion presentation of Ready to Wear in London. 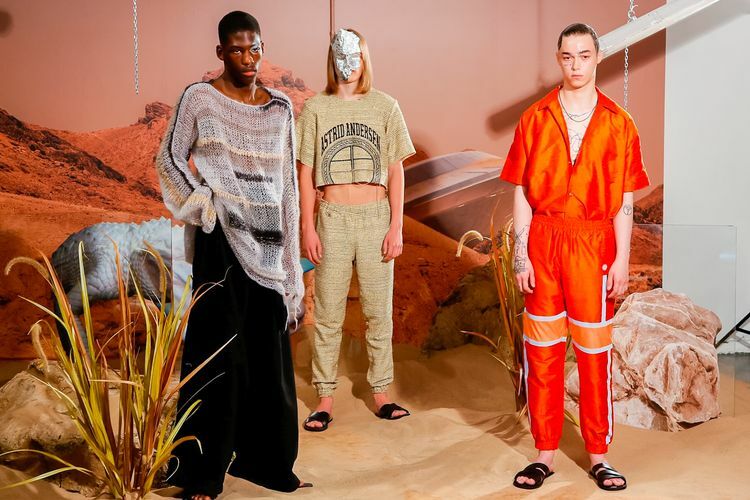 Designer Astrid Andersen presents a collection for Spring/Summer 2019 at the Covent Garden London, having planet Mars as an inspiration and the set is having this martian feeling in red, Andersen did a very intimate ceremony for fashion lovers. 10menmagazine –Andersen supporter– share comments about the presentation: Quiet on set please, @astridandersens is so over doing a show this season, instead the presentation took us on set of the Spring/ Summer 2019 lookbook. Why? “The backstage moment after a show is where everything is, people want to have that conversation,” she told us. So skip the show and get straight to the conversation. Past rails of new season menswear which we will come back to to dissect was a “’60s, ’70s retro space DIY” situation. Natural meets artificial, a hybrid of the two worlds in what could also be our back garden. In our dreams. It was a whole lot of spacey age tech tracksuits in flashes of orange and the sleekest silver with a bit of crocodile action. Albino crocodiles were printed onto t shirts, all part of this new world that Astrid has created, an evolution of last season but we’re seeing it as another portal perhaps. Super fine summer knitwear to catch that crocodile and striped shirting under t-shirts was the old school way forward. It was exactly what we want, need, adore, desire. Who needs a show? Just get on set.